I built a self watering greenhouse a few months ago. the self watering system has worked OK for the most part... But.. it does develop some nasty green slime in the water, due to lack of oxygen and circulation. My plan is sometime this winter I'm going to convert the still water basins to ebb and flow hydroponic. I only have about 2 amps 12 volts of solar available. So running an aerator with a stone and a pump is out of the equation. Why not kill 2 birds by having the pump do both? I settled on a 12 volt 325 GPH pump that draws around 2.5 amps. I want to keep the head pressure and restrictions to a minimum. So I designed the 4 venturi mini tower aeration system. Based on Bernoulli’s Principal, which states that as the speed of a fluid increases, the pressure within it decreases. 1-30-14, I have an actual system up and running using the mini tower, I made a few changes to the project based on my observations to maximize aeration. My circulating pump, in the system, is about 150 gph at a 7' head. I started out thinking I could make these with brass bar stock and copper pipe fittings. Big fail on that. I had loads of trouble trying to bore a taper in the brass stock and only seceded in burning up a not so expensive drill. So a trip to Tap Plastics got me a 2' piece of 1" diameter Delrin plastic bar stock I cut four 4" pieces to start. Lucky me, I have a wonderful vintage Southbend metal lathe affectionately known as the thunderbolt belt slapper. I got this lathe with about 500 other tools back in 1985 from my uncles father in law, and have been carting it around from boat to place to boat to place ever since. Start by boring a 1/4" hole all the way through the piece, this will be your pilot hole. Edit 1-30-14 you can skip this step, just start by boring the tapers. In my case my pump puts out 150 GPH so I wound up needing a smaller hole connecting the 2 tapers, 7/32" seems to be about the right size. When I started thinking about this project I figured the hardest part would be boring the tapers. I was wrong. Turns out Harbor Freight has a drill called a stepless step drill! what?!! yes that's right, with the Delrin anyway no need to calculate an bore a series of stepped down holes and then use a tapered reamer. I bought 2 sets of these stepless drill bits. The trick here with plastic is to not go too slow (melt the plastic) or too fast (melt the plastic) Speeds and feeds... 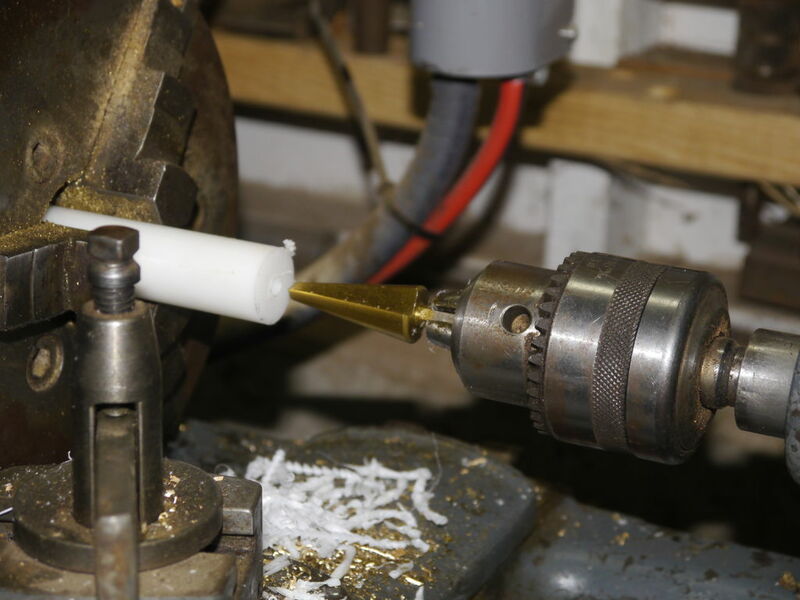 I went about 1/16" of an inch on each pass, with the lathe set on its lowest speed (without engaging the back gears, which is really slow) , then drew the drill out and cleared the chips. Slow going but a lot faster than trying to do the same thing with brass. Bore both ends, the idea is to have the inside of the venturi shaped like an hourglass. 3/32" above the center of the piece drill 2 opposing (edit based on an actual system up and running, make the air hole 3/32") 3/32" holes to allow air to get sucked in and mix with the water. I used a drill press. The 1/2 inch chuck on may drill press was too big to effectively chuck a 2.5 mm drill bit. No problem I just chucked a smaller chuck. Put it all together, I turned a piece of 1/4 inch acrylic to a 4 inch diameter and bored 4 holes in it for the four venturis then crazy glued the venturis to the piece. this will sit inside a piece 4" plastic drain pipe and create the tower. The water is pumped into the top of the tower and flows threw the venturis via gravity this is based on Bernoulli’s Principal, which states that as the speed of a fluid increases, the pressure within it decreases. A couple of pieces of cedar hold up the quad venturi, inside the drain pipe. the screw in the middle just fills the hole used for turning the piece. Seal the acrylic plate to the drain pipe with silicone. This is what I like to see. tiny bubbles! Hydro Mini Towers at work. I have 3 of them in my greenhouse hydroponic system. the worked great for the lettuce, arugula and watercress over the winter. I'm starting tomatoes, basil and cantaloupe for the spring / summer season now.Last picture is the first cantaloupe. This is a lot of hard work, but the end product looks amazing. I am always inspired by the ingenuity of my fellow hydroponic gardeners on this site. shucking yr problems there huh chuck. No lathe, no problem. My first choice would be to join TechShop and take advantage of all the great classes and tools they offer, including the CNC and non CNC lathes . Choice 2 is search for DIY wine aerator, there are plans for one made out of PVC pipe parts. Choice 3 is use a few common garden hose siphons. I have not tested the hose siphon but it looks like it should work. Choice 2 and 3 will save a chunk of change over using off the shelf wine aerators. ehh tech this tech shop that u speak of. theres none over here on the east caost wat so ever. May I ask about the noise-level of such a thing? Does it bubble a lot or could you think it can be (sound-)isolated to be used near a veranda? It makes just a slight amount of noise similar to a wine aerator. The 12 volt pump is very noisy. A small 110v submersible pump would be much quieter.